When this process is complete, you should then begin the main process. It is an easy process to follow hence anyone can try it. It involves first applying the base to ¾ of your nails and the dipping the nails into the natural powder. After this, take the colour container that you want. You should then dip your nails into the colour that you want. After the first dip, you should consider doing the second one. This one involves applying a second base and then dipping the nails again into your desired colour. The base coats should be painted in the neatest possible way. The base is made up of resin that then allows the powder to stick to the nails. You should be careful when dealing with the base to avoid it touching the nail sides and the cuticle areas. It is necessary to avoid the coat from lifting after a very short period of time. It also ensures that the powder does not stick to the sides and the cuticle areas since this might be hard to remove. The second dip is then followed by another base coat that is then allowed to dry in air. This is then followed by a coat of seal protect to avoid the colour from chipping off and to create a strong bond. When this is complete, ensure that you dust off the fingers to eliminate the excess powder. Shape the nails by filing them off and ensure that you buff the surfaces in the gentlest way possible to avoid ruining the manicure. You will then realize that the load to shake off in this process is very little and the process is very easy. Wash off the hands and apply another layer of seal protect. Wipe the nails using 91% isopropyl alcohol. Many customers saw this as a very easy process that everyone can follow. The tutorials also involve a way to add a tip at the nail edge which makes your nails more stunning than you can even imagine. When you are done, the nails will feel more sturdy compared to the other soak-off gels in the market. The look is just like that of acrylics with the only difference being the fact that you will not have to face the odour that emanates from that monomer liquid. The finish from Kiarasky powder is less bulky in comparison with the other gels and polishes. This system makes use of acrylic powder and resin. The resin used produces an odour like that of nail glues but it is not as strong as the liquid monomer that leads to headaches. You also do not need a drill to remove the powder of your nails. You need less than half an hour to soak off the nails and remove the powder. Is that not easy and fascinating? You can then enjoy at least 2 to 3 weeks of an amazing manicure. 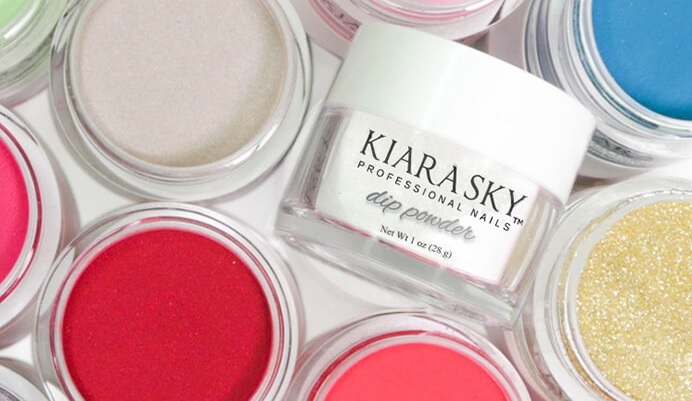 Kiarasky powders are unlike any of the other powders that we can ever think about. They come in different colours that you can choose from. These colours will always give you that perfect look that you have always wanted. Moreover, the application process is easy to follow which makes the powder easy to use at home. You do not need to be a professional to use it. Moreover, you will just need less than 30 minutes to soak off the gel and remove it from the nails.